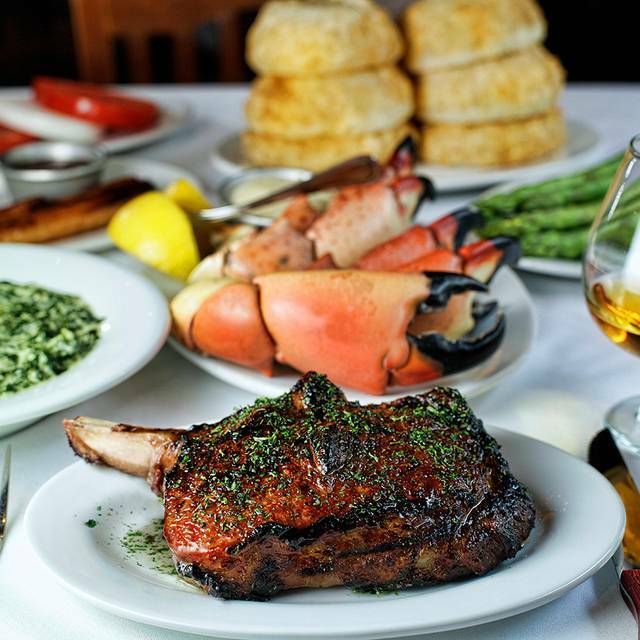 You must make reservations at least 5 minutes in advance of the time at New York Prime Steakhouse - Buckhead. Located on the ground floor of Monarch Tower. Complimentary valet and self parking are available. 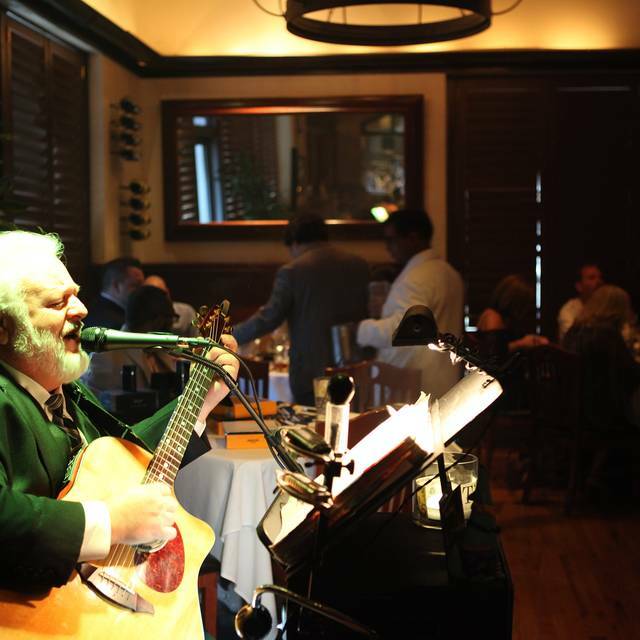 Enjoy live entertainment 7 nights a week, beginning at 6:00 p.m. 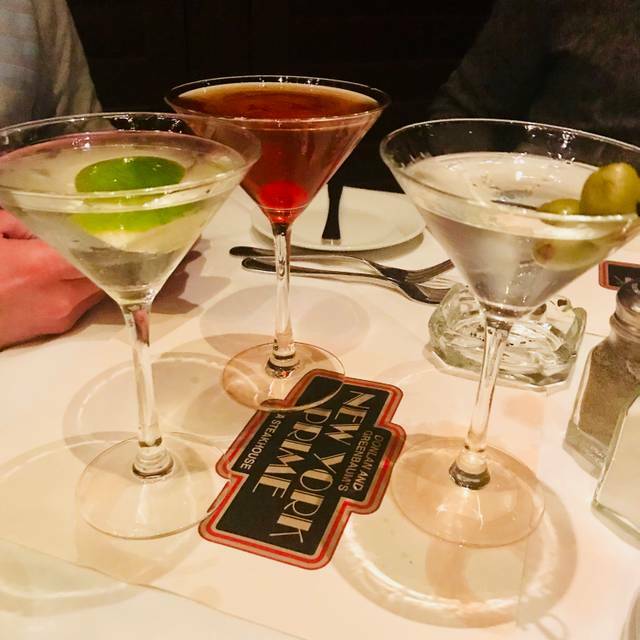 Whether celebrating a special occasion with family and friends or hosting a corporate event, New York Prime Steakhouse can accommodate all of your special event needs. 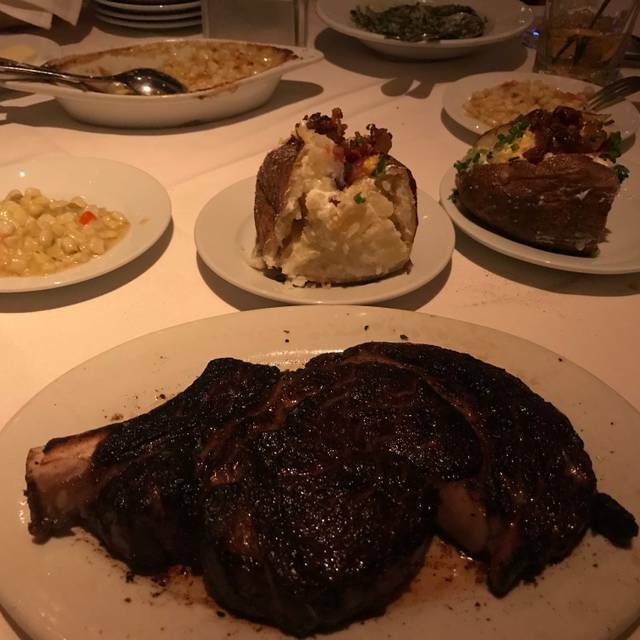 This lively steakhouse in the center of Buckhead has been voted “Best Steakhouse” 12 years running, by Jezebel Magazine readers’. 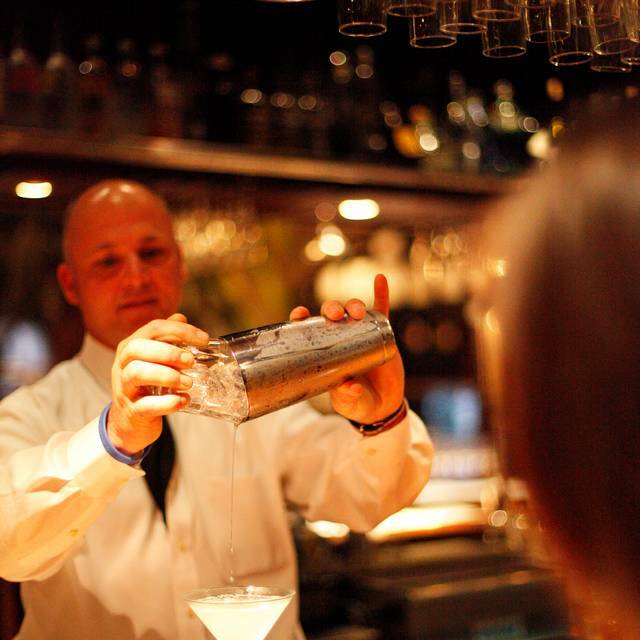 New York Prime has been a sought after hot spot for any night out, thanks to the lively bar and USDA prime-only menu. 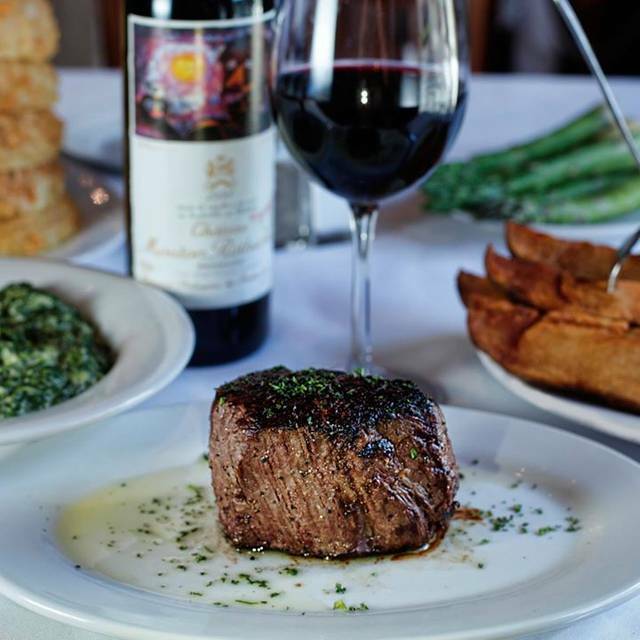 From barrel cut filets to top-of-the-line cooking techniques, every detail counts at this powerhouse, old-school steak joint, but what sets them apart further is the live music nightly, courtyard dining and private room. We'll cheers to that! Located in Monarch Tower. Complementary valet available. Cigar smoking permitted in bar area. Directions: Use the Lenox Rd ramp between Ritz-Carlton Buckhead and Phipps Plaza. Most of the food was very good. My son ordered his lamb medium rare and it was served rare. The brussel sprouts were average. I could have used more hollandaise on my crab benedict. Presentation of the food on the plates was above average, but not exceptional. Our waitress was very good until the end. We waited a long time for dessert and a long time after that for our check. We ended up being late for theatre performances. New York Prime never disappoints! Great steaks and amazing sides. Got to get the southwestern creamed corn! The steaks were cooked to perfection for everyone and the service was great! My husband and I went for my birthday. It was an incredible experience! We will be back. Always great! It was my colleagues first time & it was a hit. I regularly go to the Boca Raton location, so knew what to expect! Always a great time at NY Prime . Bobby’s an awesome host and Scott was great . ( not to mention Kelly and Andy behind the bar. Definitely our Monday night spot ! Service was good and food was excellent, however we wreaked of cigarette smoke by the time we left. It’s unusual to find a restaurant in Atlanta that still allows active smoking at a bar that shares its space with the dining area. One of the best steaks I ever had, but my wife is very sensitive to cigarette smoke inhalation and this brought down our overall experience. The 2nd hand smoke takes some getting use to. Our master waiter Jeff was fabulous. I have dined here many times and it has never been anything less than fantastic. That being said this experience of wonderful food and superb service comes at a price. This is not an inexpensive dining experience but it worth the money. And for those that enjoy a cigar.....you can smoke at the bar. For this that don’t like smoke, don’t worry the air filtration system is spectacular so you’ll never notice the smoke while dining. The waiter was very sweet, but she was slow, and she forgot to bring the corn i asked. I was able to send things back that I didn’t care for. Nonetheless the food took a long time, it was not good, I got chicken my friend got fish, the food was bland. However the owner was very welcoming and sweet. There was a live singer who did awesome, the place was clean. The people were nice. Just took very long for everything, and food was bland. Cigar smoke was too much. Bobby Dolan and staff always are the BEST. Scott took great care of us. Our server was very knowledgeable. She answered our questions with ease and she also went above and beyond. The dining experience was five star plus. Service is top-notch better than most fine dining restaurants.Steak entrées and side items were cooked to perfection. Restaurant ambience is great for a date night or just a dining out with the family. I’d highly recommend New York prime in Buckhead. Smoking is allowed at the bar and since it is an open space, it was all in the restaurant. Didn’t know this was allowed anywhere, and it made us both physically ill. Food and service were good, but unless you’re a smoker or love the smell of a smoky bar, don’t waste your money. You’ll regret it. Our server Andi was great. She was able to get us in to eat at the bar and was very attentive to our needs. 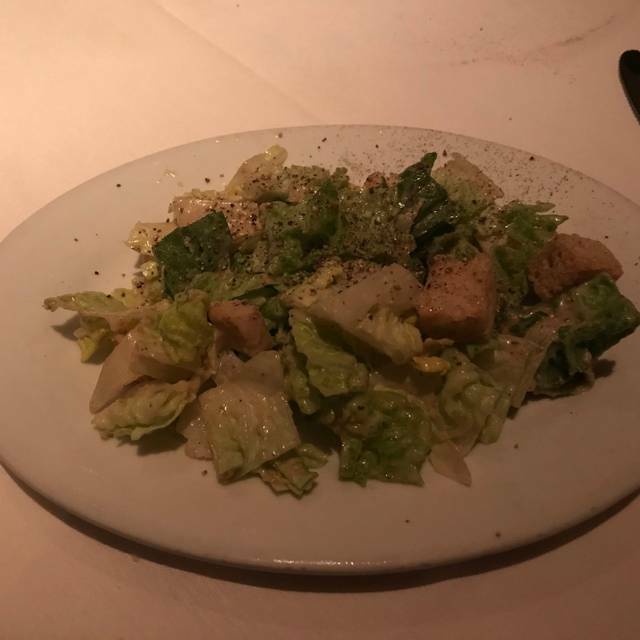 My husband and I dined at New York Prime for the first time, and we had an excellent time. We were celebrating our 29 year anniversary and they sat us at a nice booth. I can’t say enough great things about this place. Everything was excellent, from the service, to the food. Went here for our wedding anniversary and had an awesome experience. Very romantic and the food was great! Great service also! Definitely recommend. The food and service was outstanding!! Everything was amazing from the time we walked in until the time we left. The steaks were cooked perfectly! The service and food were outstanding. I had the 12 oz prime cut filet cooked rare plus. I also tried my fiance's sea bass. Both were cooked to perfection. If you like cigars, NY Prime allows cigar smoking at the bar area. Took my 11 yo son there at his request. He heard that they had the best steak in town. He likes “Pittsburghed” and this was the place to go. Ambiance was good but restaurant permeated of cigar smoke. Pleasing to some I am sure but a put off to others. Greeted by pleasant maitre’d.. he was genuinely concerned about our satisfaction and even knew enough about us to ask about our hometown (Tuscaloosa). This was a plus. The service was impeccable. Steaks were as expected. He had the Strip and I the bone in filet. Med rare was as expected. Excellent flavor and temperature. Stone crab for app... very cold but sweet to the taste. Potatoes with cheese very delicious as was the asparagus. Wine selection was good but pricey. Desserts of apple crisp and warm chocolate chip cookie were fantastic. My only complaint was a bill of >150 per person which I consider to be on the high end. It was overall an excellent dining experience. The food was amazing. Several of our guests said it was the best they’d ever eaten. It was very, very good, but I eat at a lot of 5-star places around the country. It was one of the best, though. I’m not sure where they got their stone crabs, but those WERE the best stone crabs I’ve ever had. They had enormous lobsters; the absolute largest I’ve ever seen. Everything was very well prepared. The bar is a smoking bar and it was obvious as soon as we walked in, but the restaurant is not and there were no tobacco odors at our table from the bar. The service was great. The live musician was great, but he did make it a little loud in there. The meal was impeccable and I closed business as a result. Thank you. Outstanding Service and food. Steaks were perfect and best service. Would highly recommend based on our experience. Owner really cares about his business and clients. Never felt rushed like other restaurants. First class food and service experience! 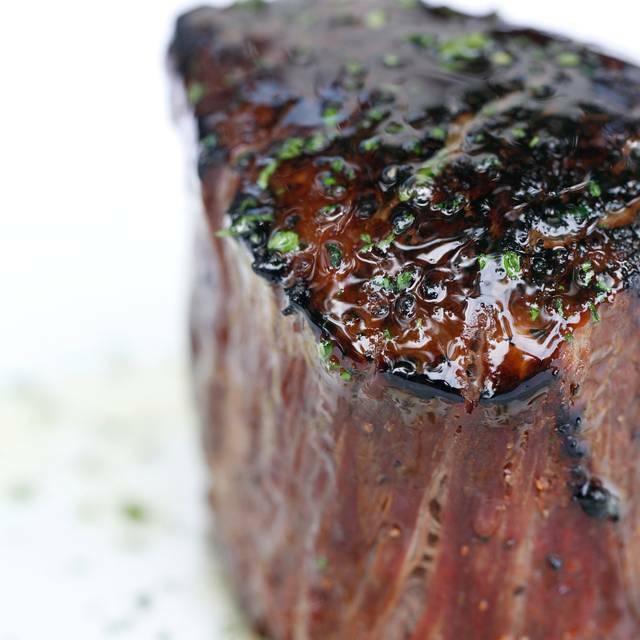 New York Prime is on the list every time we come to Atlanta! Fabulous! Wonderful evening where the true meaning of fine dining is encouraged and appreciated. From the moment we walked in until we left everything was perfect! Scott, our server was professional, friendly, personable and delightful. His recommendations on our desired grilling of our steaks to the French Dressing were spot on. We cannot say enough to compliment the staff, restaurant, and overall experience at the New York Prime. Thank you for making our anniversary a memorable evening. Food was outstanding and service was pretty good. Live music was great. Excellent, we will go back!!! Great food and amazing service. We weren't aware of the smoking. That's the only thing we didn't enjoy. Shrimp and steak was amazing and we'll def go back. Great food with great service. The steak and cheese potatoes were so delicious. We had a awesome experience! Everything was on point, from the atmosphere to the delicious lamb chops. The staff was very attentive and just super nice. This was a treat that we will definitely be granting ourselves again. The service was perfect. The food was so tasty and well served. We love the staff and the food but the cigar smoke is too much. We won’t probably go back if the smoking isn’t stopped. Our clothes were full of smoke and we sat as far away from the bar as possible. It’s a shame such a wonderful restaurant has that. Otherwise, the good is always excellent and the service superb! Lets just start with this, If you want a great steak, this place is a go to. I myself work in a high class steakhouse and am very particular about my tastes. My girlfriend's birthday is on valentine's day so I brought her here. One problem I had about this place is that they wouldn't allow me to bring my own wine by the bottle to drink! (Darioush 2015, I purchased this bottle for $100 in the wine shop, It is $170 on their wine list) Regardless of what wine is on your menu, charge me $50-$75 for the corkage fee, I don't care but let me drink the wine I brought to your establishment! I ended up paying nearly $250 in food alone so It's not like I didn't bring in business. You guys got to step up your game, especially on the occasion, make the exception! As for next time, I take my money elsewhere. Great! Excellent service can’t wait to go back !